Biden Tells NPR He Has 'No Plans' To Run In 2020 : The Two-Way The former vice president and Senate veteran also responds to a new book by ex-interim DNC head Donna Brazile in which she says that she considered replacing Hillary Clinton as the nominee with Biden. Former Vice President Joe Biden says he would not have had "any part" of an effort to replace Hillary Clinton as the 2016 Democratic presidential nominee. 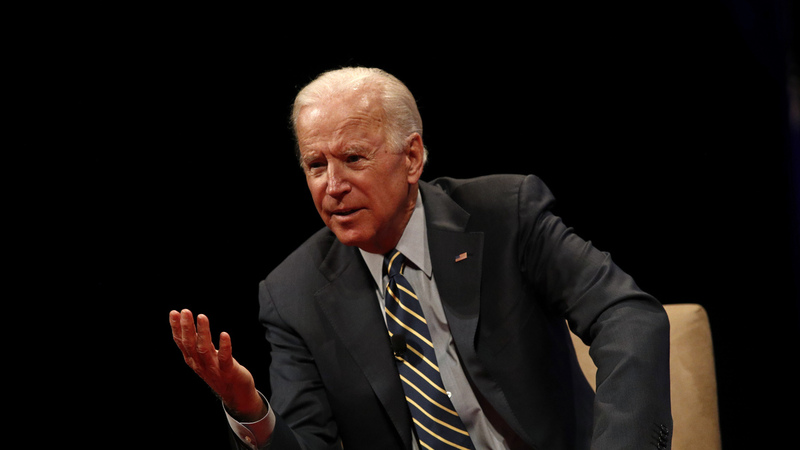 Former Vice President Joe Biden, in an interview that aired on Wednesday's Morning Edition, says that he has no plans to run for president in 2020 but that it would be "foolish" to rule it out entirely. Biden also responds to a new book by Donna Brazile, the former interim head of the Democratic National Committee. She wrote that after Hillary Clinton suffered a fainting spell on the campaign trail, Brazile considered replacing her as the nominee in favor of Biden. The former vice president and 36-year Senate veteran, who is promoting a book of his own about dealing with the death of his eldest son, tells NPR's Michel Martin that the party "never talked about replacing her." "Had they, I would have made it clear that I would not be any part of that," Biden says. In Hacks: The Inside Story of the Break-ins and Breakdowns That Put Donald Trump in the White House, Brazile writes that the Clinton campaign gained significant control over the DNC's finances as early as 2015. Brazile, speaking earlier on NPR's Weekend Edition Sunday, said she believed the takeover of the party was unethical but did not result in a rigging of the primary against Vermont Sen. Bernie Sanders. In Wednesday's interview, Biden pushed back on the notion that the Clinton campaign's relationship with the party was unusual, echoing a letter from nearly 100 former Clinton campaign staffers. "What I've noticed is whoever the candidate is controls the DNC," he says. "So, I didn't find anything unusual in the putative nominee being the person who was the dominant force in the DNC." He also discussed other topics. "I don't think. I know they did," Biden says. "They were at a minimum trying to invoke some sense of chaos in the election. And I think it's pretty clear they hoped their efforts would elect Donald Trump." "It's distasteful," he says, adding that he predicted that the Republicans would be unable to get rid of Obamacare. "They can damage it, but not repeal it." Speaking of the administration's effect on gay rights, he says, "They are going to make it harder; they are going to slow it up." But he notes that many decisions have already been made: "The American people have already crossed the Rubicon on the vast majority of these things." On President Trump's response to white supremacist violence in Charlottesville, Va.
"Silence is complicity. Not only was it not condemned, you had the president making a relative comparison" between the white supremacists and the people trying to stop them. "That is sick. That is dangerous." "The answer is no. I have no plans on running in 2020," Biden says, but then adds: "What people want me to say is that under no circumstances will I run. That would be a foolish thing to say." "I don't know what's going to happen two years from now," he says. "But, I've done nothing organizationally or structurally or in any other way to prepare to run for president. That is not in the cards now."